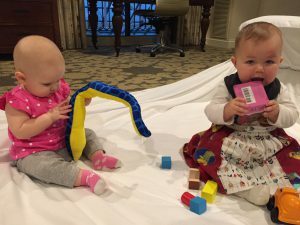 It is my pleasure to report on a two-year pilot initiative that the ARLIS/NA Executive Board recently approved: conference childcare! The initiative offered full-time childcare for children aged six months to six years at the 2017 conference in New Orleans. Five children from four families participated in the initiative, including my six-month-old daughter Grace. A local nanny service, vetted by the Executive Board, provided on-site care in one of the Hilton’s suites. The owner, Maria, was friendly, knowledgeable, and devoted to her young charges. Grace warmed up to her immediately. During my visits in between conference sessions, I often found the infants on the floor with books and blocks, while the “big kids” busied themselves building forts and tents. Parents stopped in periodically to nurse or check on their children, update their schedules with Maria, and chat with other parents. I greatly enjoyed the moments I spent with Maria and the children, which offered a brief respite from the bustling conference and allowed me to simply be “Grace’s mom” for a few minutes. This was an incredible experience for my daughter and me. I attended my first library librarian conference in 2013, when my son was seven weeks old. I dutifully packed up my electric breast pump, pump parts, bottles, ice packs, storage bags, and cooler and lugged everything from Chicago to Charlotte for four days. My pumping schedule made me feel isolated and rushed, leaving me no time to attend the conference’s social events or to explore the city. 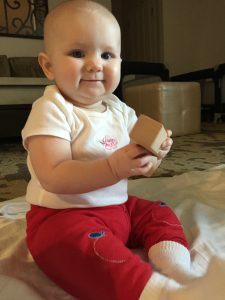 This time around, I still had a lot to pack – baby carrier, car seat, toys, diapers, extra clothes, sun hat, baby shampoo, teethers – but I was able to more fully participate in the conference’s activities. Grace even attended the Welcome Reception with me! It certainly wasn’t easy going through airport security with Grace, amusing her on my lap for the two-hour flights, or strapping her car seat into a taxi, but I would do it again in a heartbeat. The benefits of having my little nursling with me far outweighed the drawbacks. Conference childcare will be back next year in New York City, and I encourage you to take advantage of this groundbreaking initiative, one practically unheard-of among professional organizations. Please reach out to Anna Simon or me if you have any questions.